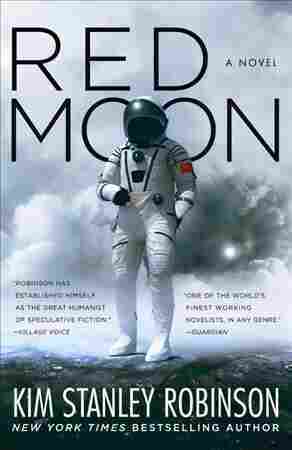 In 'Red Moon,' Too Much Information Eclipses The Story Kim Stanley Robinson's new book kicks off with a murder on the moon — which sounds exciting, but Red Moon spends too much time wandering off on digressions about science, technology and politics. After reading Kim Stanley Robinson's new novel, Red Moon, I now know more about the growth cycles of bamboo than I ever thought I would. I know how farming on the moon would work. I know about the mechanics of tidally locked orbital bodies, and so much about feng shui. The story is about Fred Fredericks, a man sent to the moon to deliver a special kind of telephone — person-to-person, encrypted via quantum entanglement — to Chinese governor Chang Yazu. The moon, in Robinson's future, is a black-and-white place, literally. There's a dark side and a light side, shadowed craters and shadowless plains. It has been colonized by both the U.S. and China and the two nations exist there in an icy, less than perfect détente. A cold war being fought in vacuum silence by acronymical agencies. But when Fred goes to deliver his telephone and shakes Chang's hand, both men end up poisoned — Chang fatally so. Fred wakes up in a hospital with no idea how this could've happened. An investigation begins. Fred is accused of murder, taken into custody, escapes, goes on the run (along with a woman, Qi, who's illegally gotten pregnant on the moon). There are car chases and foot chases, narrow escapes, explosions and occasional nick-of-time help from Ta Shu, a Chinese travel show host, sometime poet and all-around weird dude. All the chasing, capturing and escaping becomes a kind of proxy battle between U.S. and Chinese intelligence agencies that ramps up into revolt and revolution throughout the course of the novel. It happens (most of the time) in clipped, rapid-fire sections where everyone seems to be running everywhere all the time. That's just the story, though. And it seems that telling a story wasn't Robinson's primary goal here. Because in between all of this, Red Moon is filled with digressions on orbital mechanics, boarding schools, Chinese social engineering, Maoist theory, cryptography and agriculture. There are long (sometimes achingly long) sections where Fred and Qi do absolutely nothing but sit and wait and talk about things that need explaining — either things that the readers need explained, or things that Robinson just felt you might like to know about. Hierarchies within the Communist party, perhaps. Or rebellion, artificial intelligence and the gig economy. It's interesting if you care, less so you if you don't, and it's so disruptive that it seems like Robinson is deliberately trying to interrupt the flow of the action — because so much of actual life is about waiting, Red Moon seems to argue. And so many actual battles are simply about two or ten or a million people sitting down and arguing about an idea, and the slow shift in who believes what. So on the one hand, moon murder! And who doesn't love that? On the other, there's Kim Stanley Robinson laying down an extended, 400-page riff on a future where an ascendant China has become the world's superpower and human law, politics, class and culture are all being reforged in the harsh environment of lunar colonies. That's how he chose to write his book. And that's fine. It's just no way to tell a story. Give 'em a little moon murder and then they'll GLADLY stick around for my lecture on quantum cryptography! It bothers me, personally, because there's a gestalt sense to the entire novel, first page to last page, that Robinson had something really important he wanted to say about China, the role of technology and the politics of social upheaval, and that everything else (the plot, the characters, the poet Ta Shu especially) was gimmicked up exclusively to that end. Like puppets, his characters exist only to tumble into conversations about the things Robinson wants to talk about. And yes, I understand that every story works that way. But in Red Moon you can really see the strings. It feels like a spoonful-of-sugar-helps-the-medicine-go-down kind of situation. Give 'em a little moon murder and then they'll GLADLY stick around for my lecture on quantum cryptography! Yes, Robinson is something of a founding father in the world of hard science fiction. He tells stories about things that work in the future, built (often) after the failings of things that don't work today. There's no faster-than-light travel in a Kim Stanley Robinson book. No black-box magic or hand-wavy explanations for things that can't exist. His world-building is meticulous. He is a utopian realist, and his heroes are almost always scientists, not soldiers. Fred Fredericks? He's a high-functioning quantum telephone engineer with a spectrum disorder who, at one point, spends six entire pages explaining the pilot wave interpretation of quantum mechanics to Qi (including a kitchen sink science experiment). And I like him for all those things. But Red Moon reads like a TED Talk being given in the middle of a car chase. Too often, it sacrifices rhythm and structure for pages of back-and-forth debate. Fascinating, sure. Occasionally revolutionary, and beautifully deliberated. But ultimately it makes for a book that is too dry, didactic and choppy to sustain itself through to the end.